Walk down any beauty store aisle and you’ll be amazed at the different face wash options. Among these are dozens of acne products that claim to help control oil and bacteria-causing acne on the skin. However, not all acne products will help you achieve clear skin. In fact, some can actually make your blemishes worse. Whether you’re dealing with hormonal acne caused by sensitivity to androgens or breakouts due to a poor diet, the right acne cleanser and toner can help. For the best acne face wash and toner, we recommend the AZA Cleanser and Toner. Throughout the day, your skin is exposed to bacteria, viruses, and various pollutants. Facial cleansers are designed to remove dirt, oil, and other unwanted debris from the skin. Regular face washing is the most effective way to remove these impurities and give your skin a fresh face look. If you suffer from acne, you want to choose a gentle cleanser that won’t further irritate your inflamed skin. The Purifying AZA Cleanser is an excellent option. 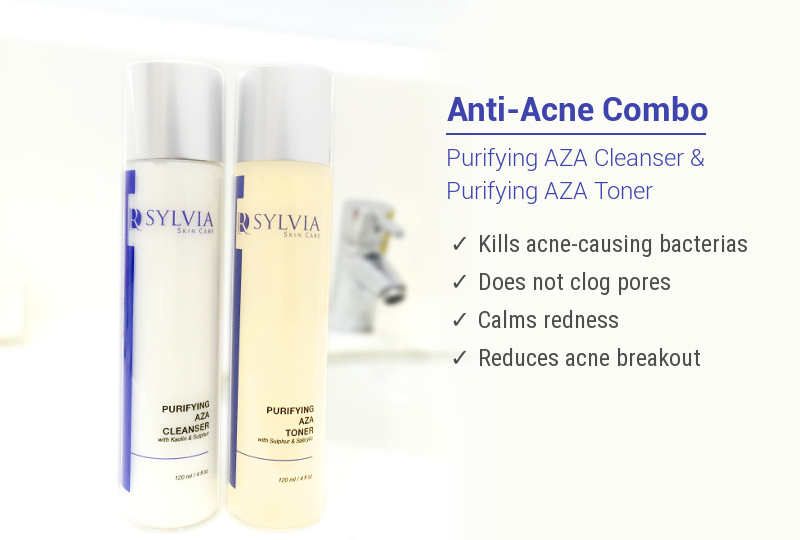 Available from Dr. Sylvia Skin Care online, the Purifying AZA Cleanser is specifically designed for oily skin ‘sufferers’. The mild wash targets the redness and inflammation commonly associated with conditions such as acne. What makes the cleanser so effective is the purifying biosulphur which helps regulate hyperactivity of the sebaceous glands. The cleanser also contains Azelaic acid which provides anti-bacterial and anti-inflammatory benefits. You’ll also discover that the cleanser includes kaolin clay which draws out impurities. Toner is designed to remove traces of dirt, oil, and grime leftover after cleansing. Toners are especially helpful among people with oily or acne-prone skin, as well as individuals who wear makeup, sunscreen, or heavy skin products. The Purifying AZA Toner acts as a powerful astringent and acne treatment. Not only does it work to clear up acne marks, it also combats keratinized skin cell accumulations to keep your pores from clogging with debris. The Purifying AZA Toner also contains biosulfur which provides the skin with anti-inflammatory, anti-bacterial, and sebum-regulating properties. It also has Azelaic acid, a pharmaceutical anti-agent ingredient that helps stop the growth of skin bacteria. You’ll also discover other key ingredients in the toner, including witch hazel for removing dirt and oil without drying out the skin, as well as salicylic acid which helps break down and exfoliate dead skin cells to prevent blocked pores. How you use your AZA Cleanser and Toner can make a big impact on its effectiveness. Start by soaking your face with warm (not hot) water. Hot water can cause damage to the delicate tissues. Apply an ample amount of cleanser to the skin and gently massage it into the face for about 30 seconds. Pat the skin dry with a clean towel. Soak a cotton ball with toner and pat it all over the face, giving extra focus to the nose, chin, and forehead. Perform these steps one to two times a day to help maintain acne-free skin. For more information on how to clear acne, contact our aesthetic doctor at the CutisLaser Clinics in Singapore.